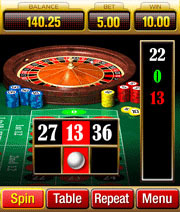 Mobile roulette is a yet another of the mobile games that has been enjoying HUGE popularity. Classical or normal roulette is one of the most played games in the world, so we can't say that it's a big surprise. However, the amounts of players who are looking to play roulette for real money by using their mobile devices increases every day! You might know that roulette is one of the oldest forms of gambling and invented in France. We can only wonder what would the inventors have said, if they could take a peak at mobile roulette that is offered nowadays! While you'd obviously want to play French roulette, as it features the smallest house edge, this isn't possible at most reputable and solid mobile casinos. The most widely offered game in those is the European roulette. However, most of the time it features the so called ''en-prison'' rule, which allows you to surrender on your outside bets and get a half of your wager back. This cuts the house edge by half, making it the same as for French roulette – 1.35%. While mobile roulette software differs by casino, there are some ground rules that are followed by pretty much any casino. These are certainly followed by our advised mobile casinos. Roulette software is downloadable and will work with any phone, that supports Java. Those with more advanced phones will enjoy extra perks, such as more lively graphics and animations. If you are a touch screen phone owner, you'll have an option to use that too! It's crazy how far technology has gotten us. Statistic fields on top of the table – these will show the last numbers that have fallen, your cash balance, bet size and amount won in a particular spin. Interface will also feature two clearly visible buttons ''ReBet'' and ''Spin''. The second view at the table will only show you the layout of numbers and the following buttons – ''Spin'', ''ReBet'', ''Clear All'' and ''Undo''. You will also have two extra numbers for adjusting of bet size. These are marked as + and – with chip denomination in the middle of them. All Slots Casino – With one of the best mobile roulette games on the offer, All Slots Casino has gotten the first spot and comes as a nr. 1 choice for roulette addicts. Not only their reputation is great and they have been around since 2000, but they also feature a stunning software. Mobile roulette table is clean and available in two views, each of whom fits different needs and desires. Mobile version of roulette is offered in a version of European roulette. Read our All Slots Mobile Casino Review, for more information. SlotLand Casino – SlotLand is top notch in every game type they offer. Be it Blackjack, Craps or roulette. Mobile casino version of this casino is made with one, very important thing in mind – user experience. SlotLand Mobile Casino offers the most popular, European roulette type to its customers. You'll also earn various VIP rewards by doing so. This casino gets some extra attention for one reason – it accepts USA players! Learn more by reading our SlotLand Mobile Casino Review.